IPR (interproximal reduction) is a procedure where, by reducing the proximal surfaces of the teeth, a very small amount of space between the teeth is created to allow the teeth to move during treatment. IPR is often recommended when treating patients with clear aligners. There are a number of important things to keep in mind when you perform IPR. The amount and location of IPR will be recommended by ClearCorrect, but those recommendations are not absolute. You can let us know how you want to perform IPR (which teeth, when and how, no IPR, expansion, limited IPR, limited expansion, etc.). IPR is always at the discretion of the clinician and it’s up to you to make any necessary changes. Let us know what you want in the IPR and additional instructions sections of the form when you submit your case. Determine which surfaces of the teeth will be reduced. Determine which intruments and methods you want to use (abrasive strips, single- or double-sided discs, etc.). 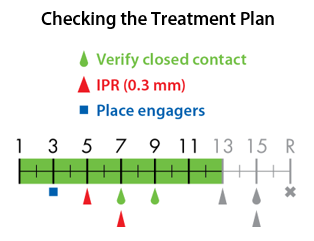 When patient is seated for delivery of new aligners, review the treatment setup or the treatment plan sent with the case to see if IPR is recommended at this appointment. If yes, confirm that the patient or parent understands the procedure and has signed an informed consent form. Prepare instrumentation as required by doctor. Identify locations and measurements of the IPR to be performed. Fully explain the IPR procedure to the patient (and the patient's guardian, if appropriate) before beginning. Always get signed consent before performing IPR. Perform any pre-IPR separation of the teeth, if necessary. Apply a small amount of topical anesthetic, if preferred by the patient. Don’t do IPR where there’s already space. 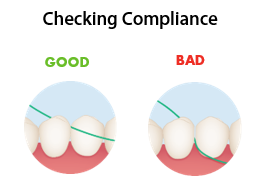 Check for contact between teeth with dental floss. Contact means patient is compliant (has been wearing their aligners). Continue treatment as planned. No contact means patient is likely not complying. Don't continue with the next step yet. Have the patient wear their current step for another 1-2 weeks and re-check for compliance at the next appointment. Consider using a disc guard if access is tenuous. Begin with the most posterior sites, working anteriorly. Begin with low RPM until desired angulation is achieved, then increase the RPM to make the reduction. Have your assistant direct an air stream across the IPR site away from your and the patient’s face. Be sure to constantly observe both the labial and lingual aspects to ensure that the teeth are not being cut inappropriately. Use light pressure on the instrument – let the abrasives do the cutting. 1 mm IPR can be achieved with abrasive strips that are 0.08mm (extra fine), 0.10mm (fine) and 0.13mm (medium). 2 mm IPR can be achieved with a one-sided disc that is 0.1 mm thick. 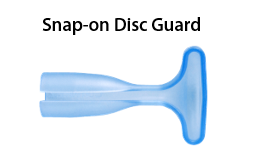 3 mm IPR can be achieved with a two-sided disc that is 0.15 to 0.2mm thick, by gently moving the disc back and forth, mesially and distally in the interproximal space until the desired space is made. 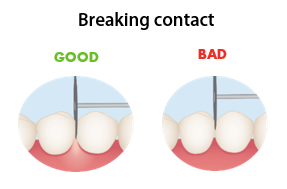 To confirm that the contact has been fully broken, stop the instrument and gently push it against the gum tissue. When reducing a contact, be sure to break the contact all the way through. The resistance will diminish and the gum tissue will blanch. Confirm interpoximal space created by using an IPR thickness gauge. Angulate the cuts so that they do not disturb the appearance of the tooth. Check the reduced surfaces with an explorer or floss to see if there are any nicks or “ledges” on the tooth. Use diamond burs or abrasive strips to round off any sharp corners. Document IPR performed including the amount and location. 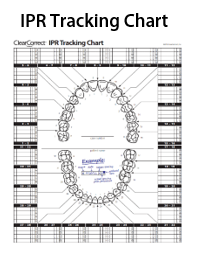 You can use the IPR Tracking Chart on our Help Center or place notes directly on the treatment plan or other paperwork. Following these best practices can help make an otherwise possibly uncomfortable experience for the patient a simple and quick visit before handing out their next set of aligners. ClearCorrect also offers a number of helpful tools for performing IPR including a full IPR Kit in our online store. Check out all of our IPR tools here.